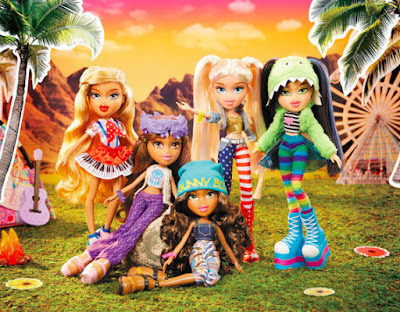 The Bratz Dolls are back this Spring with 'Super Styles And Sounds', 3 different ranges with a very 'pop' feel to them! Bratz Remix, Selfie Snaps and Festival Vibes feature the regular Bratz characters (Cloe, Jade, Yasmin, Sasha and Raya) in their usual over-the-top bright and colourful style. 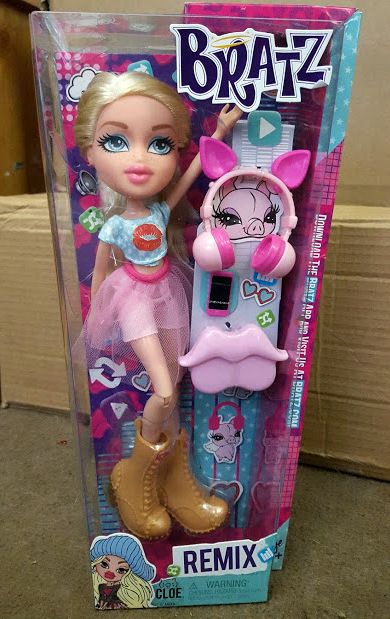 Bratz Remix reflect the characters musical taste and 'spirit animal' - each ready to dance the night away in their animal headphones. Selfie Snaps is back with new outfits and oversized emoji icons for each of the dolls. We were sent a Bratz Remix Cloe Doll to take a look at. Bratz have changed a little over the years, but are still tall and extra slim with giant eyes set into incredibly large heads. Cloe is a very pretty blonde doll with the essential really long hair. I have a long history with Bratz Dolls, as my 16 year old daughter absolutely adored her Sasha doll when she was young. It's easy to see why any school-aged girl would like Bratz Dolls. Bratz are not at all realistic and I think the fact they're clearly a caricature is a good thing. They aren't physically aspirational, no-one would actually want to have feet that big...and having the confidence to wear whatever you want and go ahead and enjoy life is something I'm okay with. The clothes might sometimes be a bit more 'grown up', but they're a definite improvement on 10 years ago and mostly quite sensible and fit for purpose. To promote the release of the new Bratz Dolls there will be lots of exciting #BratzBFF competitions on the Bratz Facebook Page and the Bratz Twitter feed, including 'I love my #BratzBFF because…' and '#HappyValentinesDay...' with a chance to win 2 #SelfieSnapsdolls and other prizes. To find out more about Bratz and watch videos, check out the Bratz website. 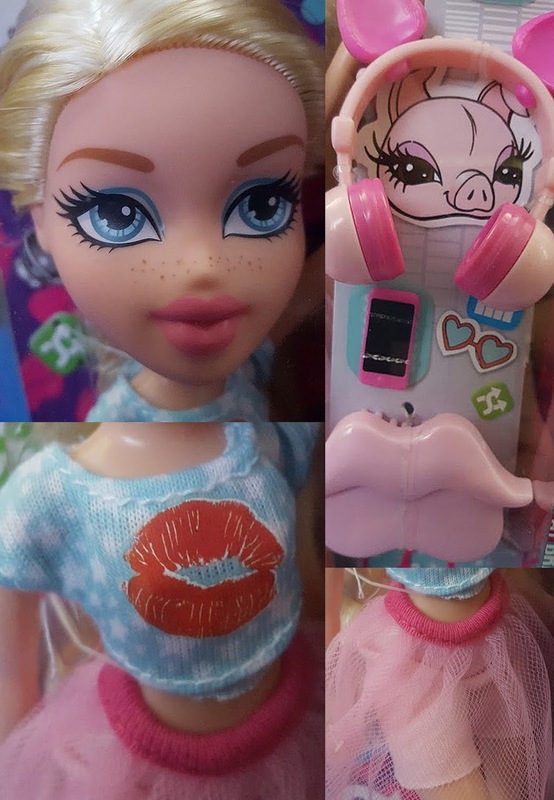 Bratz Dolls are recommended for children aged around 5-12. Available at all good toyshops and online with an rrp. of between £12.99 and £21.99. I have a Bratz Remix Doll to give away to one of my readers. Entry to the giveaway is by the Gleam form below. Please read the terms and conditions at the bottom of the Gleam form, open to UK entrants only. This giveaway will end at midnight Sunday 6th March. I'm a pop music fan! I love a mix of classical music, piano, harp and also 80s and new wave music. Indie & rock, although I love all types of music! I love a whole range of music! Although my favourite is a mix of classic rock and pop punk! I like easy listening, sounds of the seventies and eighties. A bit of everything but I love the 70's & 80's music. I love all sorts of music, at the moment all my daughter is listening too is Justin Beieber so I find myself singing along!!!! Soft rock, pop, Motown, a bit of jazz. I like 70s glam rock . I'm very eclectic, but I don't really like mindless pop music, probably more singer/songwriter and rock. I like pop and rock best. I like a wide range from the carpenters to Green day! I fell in love with country music when I fell in love with Glen Campbell. I like lots of music but especially soul and randb. I like all kinds of music from Abba to Slipknot! Soul & Motown and The Beatles are my favourites. I like all sorts of music it really depends on my mood to be honest. I'm an RnB fan, but I don't mind pop. I love all types of music but especially 80's pop (I grew up with is).